Home / health / 15 Reasons Why Sweet Potatoes Are Perfect For Diabetics ! 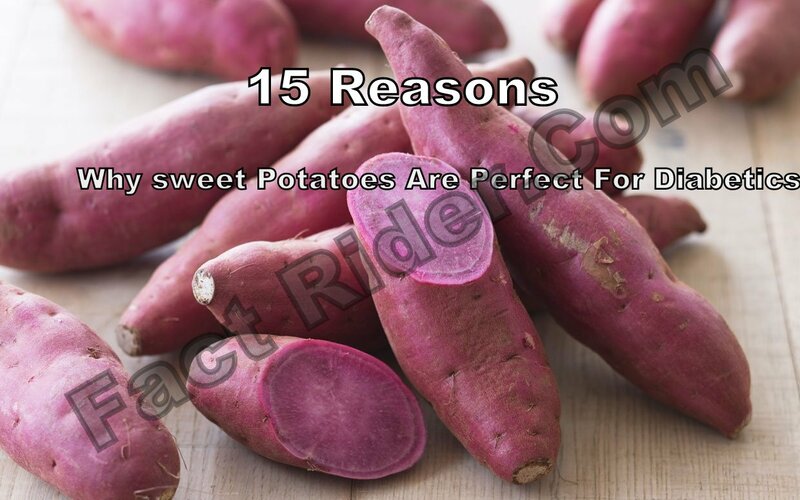 15 Reasons Why Sweet Potatoes Are Perfect For Diabetics ! Sweet potatoes come from the same order like regular potatoes, but they belong to different family and species. You can call it a unique type of potato that comes in various different colors, resembles yams and has superb nutritional values. The most common sweet potato is the one with yellow-orange or white/cream flesh.. The sweetness of the sweet potato comes from the beta-carotene. Our bodies use it to produce vitamin A, which is why it is referred to as Provitamin A. If you happen to stumble upon purple-fleshed sweet potatoes, you should buy them immediately because they are outstandingly rich in antioxidants (more than blueberries). 1. Perfect for Diabetics: Sweet potatoes have natural sugars that help diabetics lower and stabilize their insulin resistance and regulate their sugar levels. 2. Digestion: Dietary fibers are important for healthy digestive tract, and sweet potatoes are abundant in them. They help in colon cancer prevention and relieve constipation. 3. Prevents Emphysema: Smokers get emphysema (damaging of the air sacs) and are deficient in Vitamin A. The carotenoids in sweet potato that the body uses to produce Vitamin A help in the regeneration of the respiratory system. 4. Immune System: Vitamin D is important for the functioning of the thyroid gland, for the teeth, skin, heart, nerves, bones and energy levels, and sweet potatoes are a potent source of Vitamin D.
5. Healthy Heart: The heart function can be improved in overall with the help of the potassium content, which negates the sodium impact and helps with blood pressure and balances electrolytes. The Vitamin B6 in the sweet potato can help to prevent strokes, heart attacks and degenerative diseases. 6. Healthy Muscles and Tissues: The potassium contents can help athletes to reduce cramps and swelling, can provide them with energy and relaxes their muscle contractions. They also regulate nerve signals and heartbeats. 7. Anti-Oxidant: The carotenoids like beta-carotene helps with gout, arthritis, and asthma, reduce aging effects and protect against breast and lung cancers. 8. Fetal Development: It is very important for pregnant women to consume folic acid if they want a healthy fetal tissue and cell development, and sweet potatoes are a rich source of folic acid. 9. Anti-Stress: The potassium content regulates the body’s water balance, increases oxygen flow and normalizes heartbeats, while the magnesium content functions as anti-stress agent. 10. Vitamin C: Sweet potatoes are rich in Vitamin C, a vitamin crucial for the functioning of the entire body. 11. Anemia: Since sweet potatoes are rich in iron they help fighting anemia because the iron plays an important role in the production of white and red blood cells. 12. Youthful Skin: If you want to boil your sweet potatoes use the water left for your skin. It can sooth irritated spots, cleanse your pores and absorb impurities. The Vitamin C will help in collagen production while Vitamin E will improve the skin complexion. Plus, you can remove wrinkles, puffiness of eyes and dark circles with the help of anthocyanins. 13. Premenstrual Symptoms: Treat severe premenstrual symptoms with the help of the manganese and iron present in sweet potatoes. 14. Quality Hair: The beta-carotene in sweet potato promotes hair growth and prevents problems like dandruff and damaged hair. 15. Minerals: Sweet potatoes are a rich source of vital minerals such as potassium, manganese, magnesium calcium and iron, which are important for the carbohydrate, protein and enzyme metabolism. However, if you have a history of oxalate urinary tract stones, you may have to avoid sweet potatoes or consult a doctor.